BODY ARMOR, personal armor, suits of armour or coats of armour all refer to protective clothing, designed to absorb and/or deflect slashing, bludgeoning and penetrating attacks by weapons. It was historically used to protect military personnel, whereas today, it is also used to protect various types of police (riot police in particular), private citizens, private security guards or bodyguards. Today there are two main types: regular non-plated personal armor (used by the people mentioned above, except combat soldiers) and hard-plate reinforced personal armor, which is used by combat soldiers, police tactical units, private citizens, and hostage rescue teams. A ballistic vest or bullet-resistant vest, often called a BULLETPROOF VEST, is an item of personal armor that helps absorb the impact and reduce or stop penetration to the body from firearm-fired projectiles- and shrapnel from explosions, and is worn on the torso. Soft vests are made of many layers of woven or laminated fibers and can protect the wearer from small-caliber handgun and shotgun projectiles, and small fragments from explosives such as hand grenades. CLASSIFICATION: There are various mandatory tests which items must pass before they can be classified as bullet-resistant. These tests specify the detailed characteristics of bullets which the material or object must be resistant to. 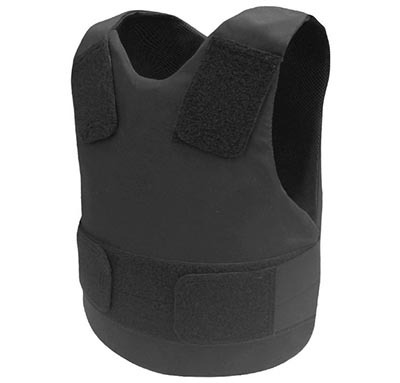 For example, the United States National Institute of Justice standard 0104.04 for bullet-resistant vests specifies that a Type II vest must not deform clay representing the wearer's body when hit by an 8.0 g (124 gr) 9 mm caliber round nosed full-metal jacket bullet travelling at up to 358 m/s (1175 ft/s); but a Type IIIA vest is needed for protection against the same bullet travelling at up to 427 m/s (1400 ft/s). In both cases, the vest is not required to protect against a second hit within 51 mm (2 inches) of the first. 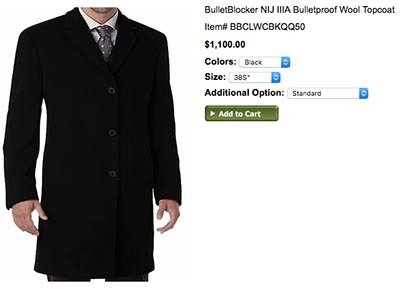 10 COOLEST BULLETPROOF THINGS YOU CAN BUY TODAY - Thrillist. 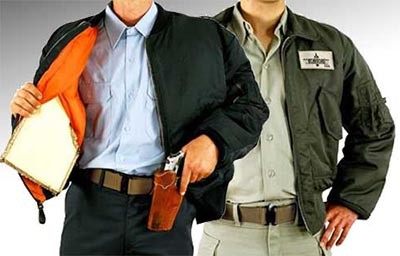 America Has a Growing Demand for Bulletproof Clothing - BodyArmorNews.com. Ballistic Resistance of Body Armor NIJ Standard - National Institute of Justice. 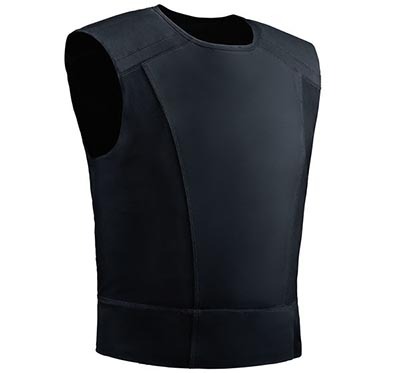 BODY ARMOR NEWS - "Specialized in providing news and updates on bullet proof vests." Bulletproof Style: Menswear Company Creates Ballistic Suits, Shirts & Even Underwear - TheBlaze. History of Body Armor and Bullet Proof Vests - ThoughtCo. How to look good when you're dodging bullets - The Independent. 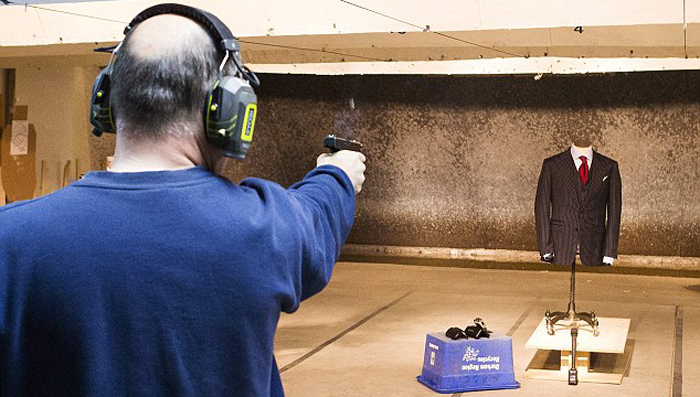 Inside America’s Growing Bulletproof Clothing Industry - Racked. John Wick’s Bulletproof Suit - "Are kevlar-lined suits the real deal?" Miguel Caballero - bulletproof clothing company based in Bogotá, Colombia, Mexico and Guatemala. It is mostly known for its fashion line of bulletproof clothing and counts among its clients King Felipe VI of Spain, the Former Mayor of New York Michael Bloomberg, the ex-President of Colombia Álvaro Uribe, the ex-President of Venezuela Hugo Chávez, the former President of the United States Barack Obama, the President of Mexico Enrique Peña Nieto and other VIPs. NIJ BODY ARMOR STANDARD OVERVIEW - "Provides The Performance Level For Most Ballistic-Resistant Vests." Secret Agent Magazine - "Find the latest fashions in anti-ballistic apparel." Suit Up With These 3 Pieces of Bulletproof Clothing - Popular Science. Style Under Fire: Our Favorite Bulletproof Clothing - GQ. The $3.2 Million Bulletproof, Diamond-Studded Suit With a Built-In A/C - Daily Mail. The Rise of Bulletproof Fashion – It's No Longer About Safety - U.S. News & World Report. This designer clothing line is stylish ... and bulletproof - CNN Tech. This Is the Bulletproof Limo of Suits - "Aspetto makes bespoke suits that could literally save your life." Esquire. Top 5 indestructible bulletproof clothes - YouTube 2:39. 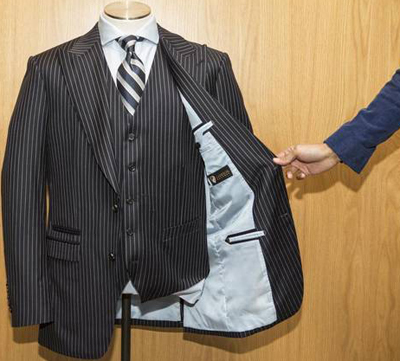 Toronto tailor introduces bulletproof three-piece suits - The Globe and Mail. Aspetto - since 2008. "Subtly Combine Style with Personal Protection." Aspetto is not just concerned with making fine clothing for the ambitious men of the world, but is also serious about your safety. 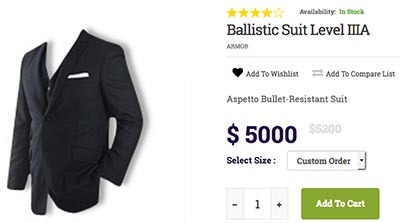 As creator of the lightest, strongest ballistic clothing in the world, Aspetto transforms the luxurious, bespoke Aspetto suits you have come to love into America’s toughest bulletproof suit with IIIA ballistic material. BIJAN - since 1976. Bulletproof lined jackets, and much more. BladeRunner - since 2007. "Bullet-Proof Clothing | Ballistic Clothing." Bladerunner stock a wide range of Bullet-Proof Clothing, including ballistic jackets, bullet-proof vests, waistcoats and plates with up to level IV ballistic protection. Our ballistic clothing is ideal for security staff, undercover police, press or simply those who want the reassurance that our bullet-proof clothing provides. BULLET BLOCKER - since 2007. 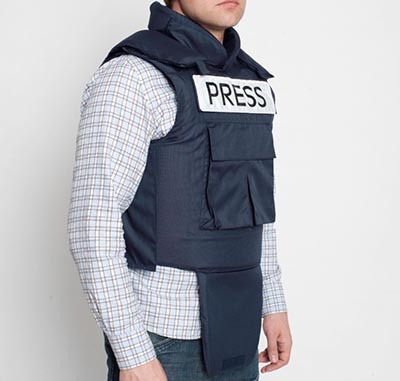 "Stylish Bulletproof Clothing." An American company. Prepare. Protect. Prevent. Engarde - since 2003. "A company specializing in state-of-the-art body armor products." Leading manufacturer of high quality body armor used by military, law enforcement and civilian security services around the world. 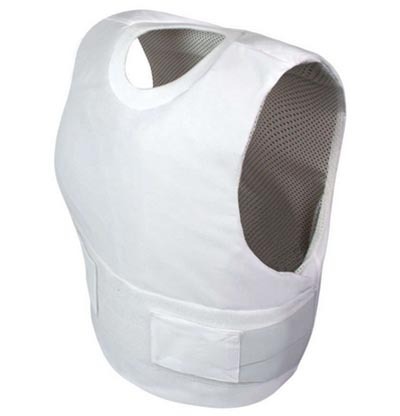 Body armor, helmets, hard armor inserts, bulletproof vests, concealable body armor, tactical body armor, vests, ballistic armor. Garrison Bespoke - since 2008. "Toronto's Best Custom Suit Tailors." 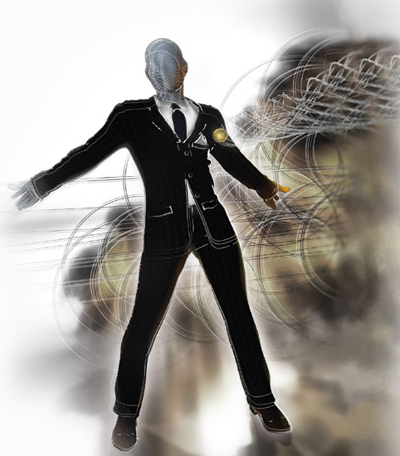 Offers bulletproof three-piece suit lined with several ultrathin sheets of carbon nanotube material that can stop a bullet or blade. The suit is built to order and starts at C$20,000. Israel-Catalog.com - "The best Israel has to offer." Lightweight bulletproof flight jacket - level III-A. Designed especially for undercover work: businessmen, detectives, bodyguards, and others to provide maximum ballistic protection. 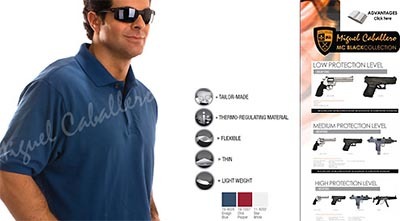 MEN'S BULLETPROOF POLO SHIRT - by Miguel Caballero: US$3,475.00. MIGUEL CABALLERO - since 1992. "The Armani of armor." Exclusive bulletproof fashion apparel. Safariland body ARMOR - since 1964. "Engineered and designed to maximize both ballistic performance and human performance. Every piece in this line has been re-invented and purpose-built for unprecedented protection, comfort and modularity." Body armor has come of age. SafeGuard ARMOR - since 2006. "Protection Personified. Body Armor | Kevlar Body Armor." Affordable Bullet Proof Body Armor From SafeGuard ARMOR, Solutions For Both Military, Security & Civilian Applications, Next Day Delivery Available Worldwide! SafeGuard Clothing - "The Perfect Civilian Body Armor Design." Globally trusted retailer of high quality body armor. All of the protective panels featured in the body armor offered by SafeGuard Clothing consist of 100% DuPont Kevlar. Suitart - Diamond Armor. 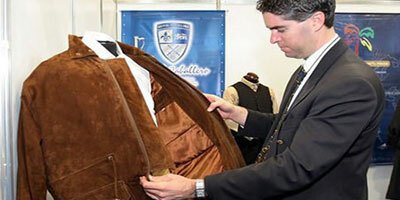 The most expensive custom tailored suit in the world: CHF2.8 million/US$3.2 million. This individual item is the result of the synergy of luxury, technology and art. Characterized by technical refinements the suit will be custom tailored for the customer. The suit is waterproof due to nano-technological sealing, bulletproof (certified by NATO standards) and equipped with an active cooling system. The lining shows an artwork, which was prominently featured in the Hollywood blockbuster “This Means War”. Additionally, the Diamond Armor is graced with 880 black diamonds decorating the buttons and the lapel.